Whenever I come back from my vacations, I end up with a lot of interesting and colorful paper: Attractions tickets and brochures, metro cards, candy and cookies wrappers, among others. Most of them are suitable to be folded into origami models that can embellish an scrapbook page about your trip, or can be used as decorations. This is one example, a simple ring that I made with Metro Cards. The ring consists of 14 "Business Cards Simple Units". The unit is very simple to fold and assemble. 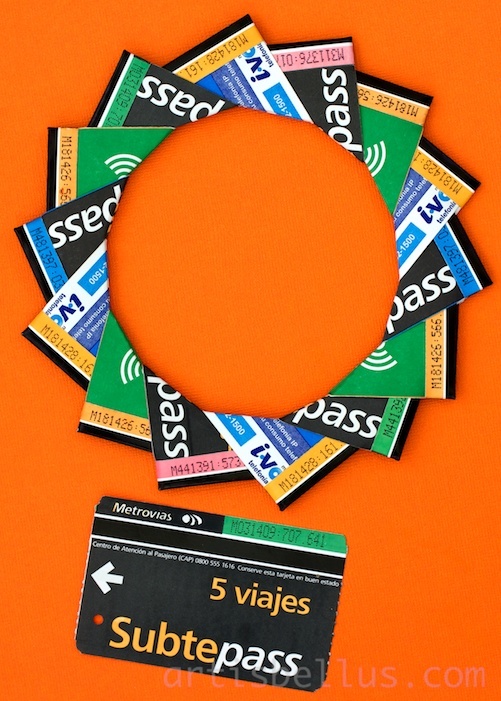 I was lucky enough to get various metro cards designs, so the ring ended up being very colorful. The instructions are available in http://www.origami-resource-center.com/business-card-ring.html. The link mentions that the units were inspired and modified from the units created by Mette Pederson, but it does not mention who created the variation. Please leave me a comment if you know the creator, so I can give him/her the proper credit.